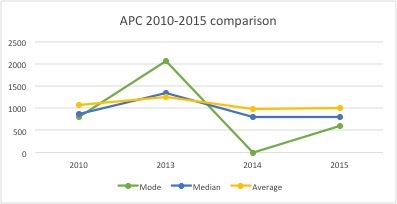 Noting the important caveat of the mythical nature of “the OA APC” as a single per-article price, following are the range, central tendencies and some highlights from our 2015 OA APC data. Note that a ll prices are in USD. The overall average of journals sampled in 2015 was $998, compared to $964 in 2014 and $906 reported by Solomon & Björk in 2010. These are modest average increases (4% 2014 – 2015, 2% per year from 2010 – 2015). However, the average may mask contradictory tendencies, such as low or no fees for new journals to attract content obscuring increases for journals that either are, or are be coming, established. From 2014 – 2015 on a per-title basis there was a fairly even 3-way split between journals that retained the same price, increased or decreased their price. Different publishers show different tendencies. Hindawi, the largest OA publisher by number of journals, has such an impact we are beginning to call this the “Hindawi factor”. 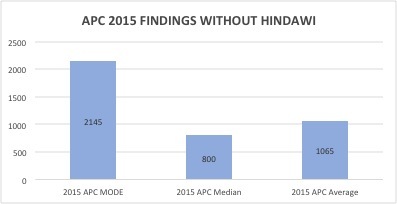 In 2015, the overall mode (most common price) is $800, while the mode without Hindawi is $2,145. 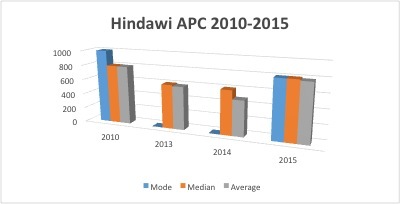 The following two charts illustrate the variation in pricing tendencies from 2010 – 2015 for the two largest OA APC publishers, Hindawi and BMC, reflecting the differences in approach to pricing for these publishers over the same time frame. 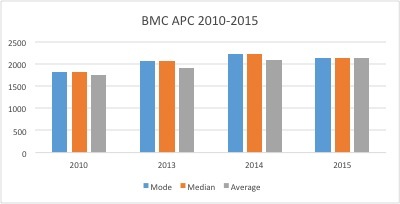 The above chart shows a relatively steady average and median in contrast with a varying mode (most common price) from 2010 – 2015. It is important to note that the samples are not entirely comparable. Notably, to facilitate the longitudinal study we have not included new publishers listed in DOAJ as of 2015. This is an important limitation. For example, DeGruyter, not present in 2014, is the 3rd largest DOAJ publisher in 2015. The following details illustrate that the average cost-to-publish in a fully OA journal with publication fees in 2015 varies from about $250 USD to $2,145 USD, depending on the measure and particular sample of journals selected. $0 APC = journals has APCs but currently price is $0. Most commonly this is used by journals that are “free for now” until more content is added. 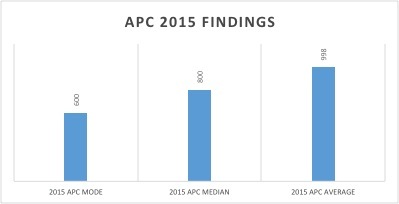 Preliminary sample: includes the 1,363 journals sampled in 2010, 2013 and/or 2014 confirmed as using APCs (excluding journals using APPC but not APC). APC of $0 (journals for which APC method is confirmed but no current charges, e.g. “free for now” approach) are included unless otherwise specified. The weighted figures adjust by a sampling factor designed to give added weight to journals from categories with lower rates of sampling, journals by publishers with less than 10 journals using APCs. Full sample: 1,999 journals including preliminary sample plus additional journals sampled from publisher’s website. See above for description of “weighted”. More details will be posted as our data analysis continues. The purpose of this post is to provide some important context for understanding OA publication charges. A key point that I would like to highlight is that the OA APC, in the sense of a single number charged for each article published, is a myth. It is important to understand this because OA journals are obviously conducting some real-world experiments that have the potential for beneficial results for high-quality, sustainable open access publishing, and providing discounts that may be needed by some authors and OA APC payers. Pricing is often tailored to reflect the work involved in publishing an article. A well-written article that is submitted in good shape with little need for language editing or copyediting with camera-ready graphics is less work to publish – this should, and sometimes does, cost less. There are a variety of discounts reflecting contributions to the journal community; discounts for editors, reviewers, society or association members, loyalty discounts for repeat authors. Details about variations on APC pricing can be found in these posts by Guinsly Mondésir (Version en français / English version). The “average” cost to pay-to-publish an article in a fully open access journal that we found in 2015 (ignoring $0 APC) ranges from an estimated $250 USD for a journal using OA page charges based on an estimate of 9 pages, to a fairly consistent median of $800, modes of $600 to $800, to averages or median numbers from $858 (weighting results to include smaller publishers) to the overall average of $998 to $1,370 for the same set of journals excluding $0 to a mode of $2,154 after removing the “Hindawi factor” (The practices of this largest OA publisher by number of journals skews the sample). Even this wide range of “averages” conceals the full complexity involved with deciphering publisher pricing and with translating currencies into USD. A set of prices, gathered on the same date in 2015, would yield different averages if the currency calculation were conducted on a different date. In gathering the data we had to make many tough decisions about the “original” currency, because a number of publishers provide pricing in several different currencies. It is harder than one might think to decide on which is the “real” price, for example when differential pricing is provided based on the author’s location. Having a single APC would be simpler, but not necessarily better if it means a loss of a discount for authors or payers who could really use them or if it eliminates an incentive to streamline the process of publishing itself in the process of transition to OA. With this important caveat we will now present our preliminary quantitative analysis of this mythical variable here. From the datasets downloaded from the Directory of Open Access Journal, we did some analysis. We found that among the journals that do offer article processing charges (APC), 87 % of them offer variations. So that the APC that the author expects to pay could be higher or lower. Those fluctuations depend on many factors. For example an article that requires language editing would have higher APC and if the author comes from a low/medium income countries then the APC will decrease. The table one shows the percentage of journals offering variations in pricing. The table 2 shows the list of the most frequent factors that contribute to APC variations. Table 1. Percentage of journals offering variations in pricing (2015). Table 2. Frequency of sub-types of variations. Please note that we did not count every variation found. For example, variations likely based on simultaneous print versions of journals such as colour charges were not capture. Nous avons analysé la liste de journaux en libre accès téléchargé du site internet du répertoire des revues en libre accès (DOAJ). Nos résultats nous démontrent que parmi les journaux qui adoptent comme modèle d’affaire la méthode de frais de publication de l’article, 87 % de ces journaux offrent une variation des frais de publication. Cela signifie que les frais que l’auteur s’attende à payer peuvent augmenter ou diminuer. Les frais supplémentaires peuvent être dû pour plusieurs raisons. Par exemple, il peut y avoit une charge additionnelle si le nombre de page excéde la limite fixée par l’éditeur. De la même manière plusieurs raisons peuvent expliquer une réduction des frais de publication de l’auteur. Par exemple, l’auteur a utilisé le gabarit de l’éditeur pour rédiger son article. Le tableau 1 montre le pourcentage de journaux dont les frais de publication de l’article peuvent varier. L’année dernière des résultats semblables ont été publiés dans cet article. Table 1. Pourcentage de journaux ayant de frais de publication avec des variations. Table 2. Les différentes sortes de variations dans les frais de publication. Nous n’avons pas compté tous les types de variations. Par exemple, les frais de publication qui semble d’être plus pertinente aux versions imprimé (frais de couleurs) sont omis ici.